Keeping track of the site statistics is probably the most underestimated secrete of a successful blog. The ideal way to know and reach your audience is through your traffic statistics, and this much is provided by Google Analytics for Free. No one knows his audience best than himself, but Google Analytics allows us to collect even more information about a certain visitor in just few seconds. 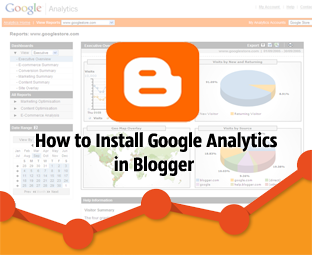 In This article, we will comprehensively discuss why Google Analytics is crucial for Bloggers and in the end, would learn How to Install Google analytics. Why Google Analytics is Significant for Webmasters? How Much Time They Spend? Keeping track of average duration visits of visitor play’s significant role is building the reputation of a blog. It gives the idea whether your content is reaching the right audience or not. On the other hand, it highlights those pages which have a high bounce rate. Basically, it helps us in removing all the loopholes that interrupt a user-friendly experience. From Where Did they arrive on your Website? This section will enable you to keep track of from where your visitors are landing on your website. It provides comprehensive details about the Referral as well as organic Traffic. It shows you what percentages of visitors are coming from search engines mainly Google, Bing or Yahoo. Under referral traffic, it displays all those links which are acting as a source of traffic for your site. Which Content is Gaining Most Traffic? It also helps in discovering that which content is getting maximum exposure from Search engines. By knowing the content, we can utilize the traffic and can make some extra affiliate sales from that certain content. Here, you have to be productive and think how you can utilize the traffic flow. It will also report those contents which have less traffic flow that needs your attention. 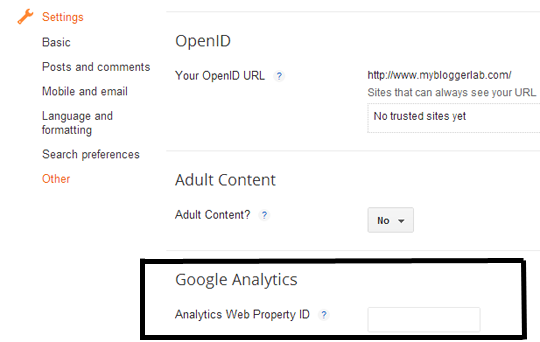 How To Sign up For Google Analytics? First thing first visit the Google Analytics sign up page and log in through your GMAIL Account. However, if you do not have a Gmail account, then first register a new account at Gmail. After signing-in to your Gmail Account it will redirect to a new page where a window will prompt like shown below. This is the place where you will sign up for Analytics. Just hit the "Sign UP" button and head to the next step. Now in this step you have to enter your personal details like Website name, Website URL, Time zone and other stuff. Carefully fill the details correctly and once done, hit the "Get Tracking ID" button and proceed to the next step. 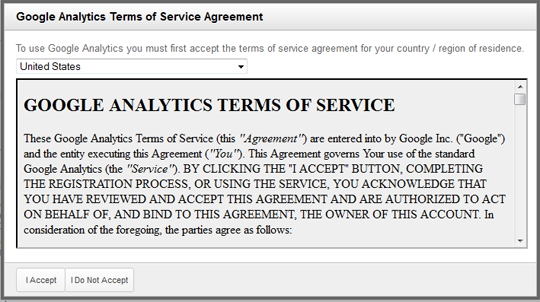 On pressing "Get Tracking ID' button, a new window will prompt, Which would consists of a Google analytics terms of service agreement. Careful read it and press "I Agree" button, and head to the next step. Copy the "Tracking ID" i.e. UA-XXXXX-Y or UA-XXXXX-YY from the Analytics Admin Panel. 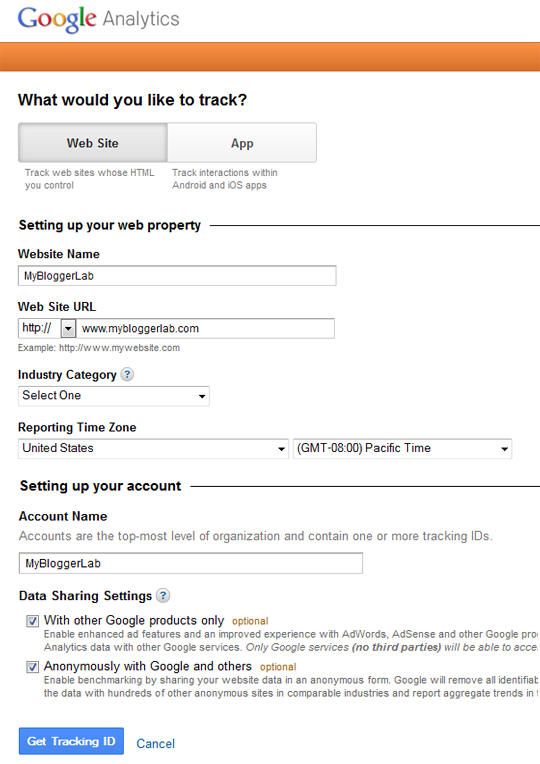 Now go to Blogger.com >> Your Site >> Settings >> Other >> Google Analytics >> and paste your Tracking ID in the text area. Add the following code in your Template right above the </body> tag. Remember: Don't forget to insert your tracking ID in the coding. Replace UA-XXXXX-Y with your tracking ID. Once every thing is done, Save the template. In this era, it is a must have for every blog no matter whether they are large or small. It's a tool that keeps and eye on your visitor every day, every hour, every minute, even every second. Feel free to ask your questions and queries using the comment form below. Firstly, You have violated one of our Comment Policy. By using Your URL in Author BIO. The only reason we haven't removed it to let everyone know that why we are publishing these articles. So here how it goes. 3. If They are published on Thousands and hundreds of websites? does that mean it is reaching the whole world? You Buy a New Mercedes Does that means others don't need to buy the same care of same model? I Guess not. 4. MyBloggerLab is a "Resource site for Novoice Bloggers", we want them to be a professional by teaching them all the tips and techniques that a Professional Webmasters uses. No matter whether its basic or whatever you would like to name it. Syed Faizan Ali Thanks for both this article and your support with the beginners and learners. Well fully agreed with Syed reply.I have one question bro how can i add my second blog to same analytics account means how to add multiple blogs to analytics? what a great answere you gave him, lovely just keep on going, we are loving your ideas. The post still lacks at some points! then this whole post would be failed, only a few % of blogs are using default templates provided by Blogger. Going hard on other bloggers doesn't hide the fact that you ran-out of ideas! " Do you think this post lacks? I don't think so buddy, i guess you have to refurbish your skills buddy because there is no need to add the Include attribution to the Templates either that is provided by Blogger or it is custom template. You can try both methods and it will work accurately without adding the attribution that you quoted. As per the Ideas, Well to be honest, we have some tons of ideas and the team is working daily to provide some highly professional content and this article is the result of that. Thanks Buddy for supporting us. Well the solution is quite straightforward. Do as we said below. 2. On the Right Side of your screen you will See "ADMIN" button Press it. 3. Now Press "New Account" Button and add your new Website. That's Great buddy, implement the tutorial as soon as possible. We Prefer the Tracking ID Method. Nonetheless what error you are facing? Nice post Syed, and agreed with your answer. Waiting for more tips like this ! Very ugly homepage customization. Revert it back to draft. Please. Its so yucky. Don't do that ever again. Syed, I guess he is using OpenId as his commenting system. So, be a little kind with people. I am seeing that you are becoming rude day by day. This is not done yet. I guess you should read your own emotion control post. That's not open ID mate. Its pure NAME/URL thing. As per the Rudeness. I am not at all. Read the Above comments properly :P. They have no harsh or anything else. Thanks for another very inspiring and informative post. Sorry Mate that Vector art and the LOGO is our copyrighted. You cannot use them. We Repeatedly Report different website who ripped our Theme by coping. Thanks for the article! !very much informative and useful..keep up the good work!! Good Job! And I like your style. How do I get rid of it if I ever wanted to and get back the Blogger statistics, without damaging any views I got over the time I had the Google Analytics? It takes seconds to track your blog. Once you have installed the code correctly. Thanks i have installed but how do i know it is installed successfully and from where i can monitor traffic. It would start tracking your site the moment it gets installed in your computer. Check out Live Visitors.